We’ve taken our Heavy Duty False Bottom setups, and kicked them up a notch. 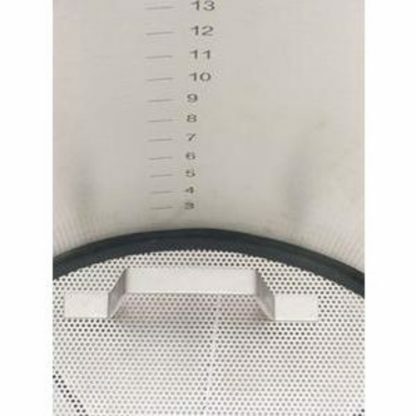 A Silicone gasket rings this false bottom, insuring no grain makes it through to your boil. 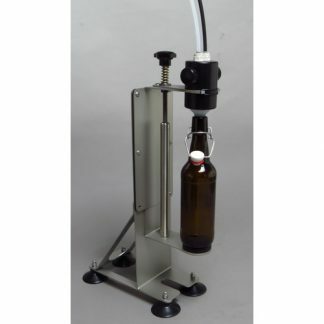 A slick Quick Disconnect Maximizer gets every last drop of wort from your mash tun, and makes installation a breeze. The maximizer is centered, and allows us to drop the False bottom closer to the kettle floor, minimizing dead space, giving you more room for those burly brews. 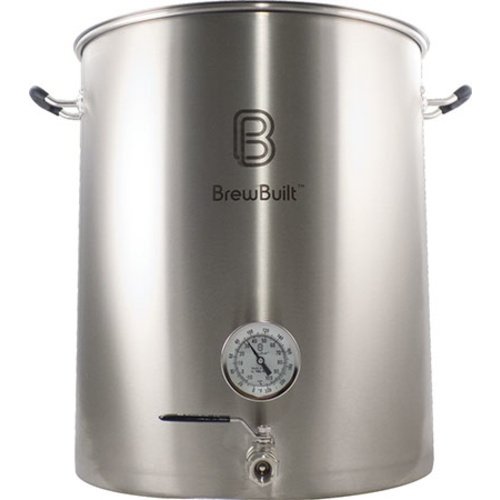 Comes with 6″ BrewBuilt BiMetal thermometer by TelTru. Some other features we dig include the internal volume markers from the bottom to the top – so handy for instant reads. The silicone sleeved handles on the kettle and the lid are a cool feature to protect your hands. The tri-clad bottom with a 4mm core of aluminum sandwiched between two layers of stainless steel offers even heat distribution during the boil and also makes it a perfect choice for anyone wanting to use an induction burner. 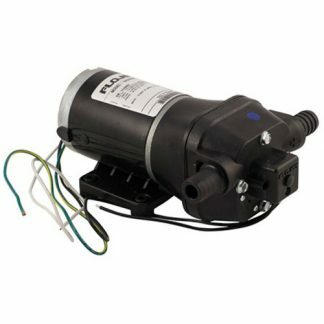 The bottom coupler is also cool with 1/2″ male threads on the outside and 1/2” female threads on the inside. 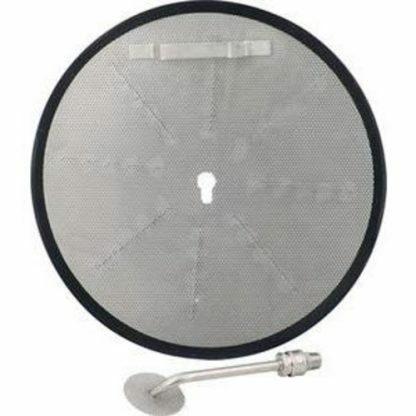 Those internal threads are so handy… you can easily install a pick up tube, stainless quick disconnects, a kettle screen, or any other fitting that features 1/2″ MPT threads. These kettles are made from 304 grade stainless. That means you will have less corrosion issues than with a kettle made from lower grade 201 type stainless. We put these kettles through a corrosive salt water test in the MoreBeer! shop and they passed with flying colors. We also made sure the rivets and riveted handles were also made of stainless steel for a long term, trouble free life. The 10 and 15 gallon size are made from 1.0mm thick stainless steel. 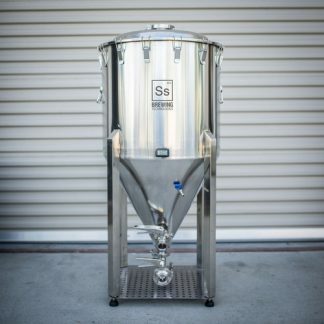 The 22 and 31 gallon size are made with 1.2mm stainless – that’s pretty thick stuff – and you will know it when you pick one up. The included ball valve is a two piece design that allows for easy cleaning (we prefer these over 3 piece for ease of assembly) and is also made from 304 stainless. This size was born from customer feedback. Many customers making 10 gallons actually want to end up with 10 gallons at the end of kegging. That means you can be starting a boil with 13-14 gallons of wort to account for boil off, kettle loss, and fermenter loss. The 22 Gallon size kettle allows you to boil those quantities with plenty of room for boil overs. Want to make a 15 gallon batch with friends… you can squeeze that in to! You’ll never regret having a little extra kettle.